Kenny Roberts arrived in Europe for his Grand Prix campaign in 1978 having dominated racing in the United States. Born on 31st December 1951 in Modesto, California, Kenny Roberts got his mother to lie about his age so he could go racing. Pretty soon the kid was winning races on his 100cc bike by such a margin that he was soon put into the 250cc class on his smaller machine! He joined the AMA national circuit in 1970 as a novice and was picked up by the Yamaha factory while still a junior. Kenny won the AMA Grand National Championship in 1973 in his second year as a 'senior' level rider - a feat which meant taking part in a gruelling schedule of events including: dirt racing on half-mile and mile ovals, TT racing (which was dirt-tracks with jumps), road-racing and short-track racing. He won the title again in 1974, but by a much bigger margin. By now road-racing was beginning to be the focus of Kenny's amazing capacity for concentration and dedication. 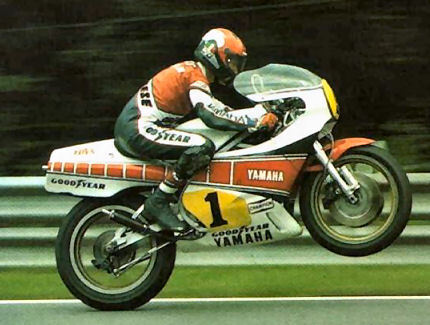 He had already raced in the British Trans-Atlantic races and taken on Giacomo Agostini at Imola so it wasn't surprising that he eventually went GP racing full-time from 1978 with Yamaha. To learn tracks faster, Kenny took part in the 250 and F750 races too, which was no mean feat on the punishing and often dangerous circuits of the day. He won the 500cc GP title first time out, winning it the next two seasons as well, making him the first rider to win three back-to-back titles since Agostini. The titles were the icing on the cake in a memorable career which included an amazing rivalry with Britian's Barry Sheene, as well as the classic title confrontation with Freddie Spencer in 1983 which went down to the wire at Imola. 'King' Kenny lost the title to Spencer by just two points. Retirement after the 1983 season didn't slow him down. He ran a team with Wayne Rainey and Alan Carter in the 1984 250cc championship before taking a few years off to re-enter in 1986 with the Lucky Strike Yamaha team. In 1990 with Marlboro backing, Kenny steered the team to the 500cc championship with Rainey and the 250cc title with John Kocinski. Rainey would emulate the feat of his team-boss and friend by re-taking the title in 1991 and 1992. Kenny eventually decided to go his own way and become a race bike manufacturer in his own right in 1997, but his spirit and determination marks him out as one of the great Yamaha champions.